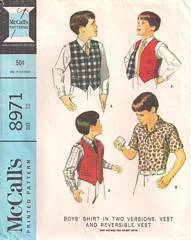 Original vintage McCall's 8971 sewing pattern from 1967. Yoked shirt with pleats at side back may have long sleeves pleated to buttoned cuffs or short sleeves. Vents has welt pockets of lining fabric. Vest back is made of lining fabric and is lined. Boys Size 12, Chest 30, Waist 25.5, Neck 13. Pattern is complete, uncut and in original folds. Envelope and contents are in excellent condition. All our vintage sewing patterns are stored in, and shipped with, acid free polypropylene archival sleeves and backing boards.